As I rolled the garage door up at 5am, I was pleasantly suprised to find it was 59 degrees F. It had been 39 on Monday, so I was expecting more of the same. As I began my journey through downtown Atlanta and then down through the southside, it was apparent my plan of leaving early and missing the morning commute traffic had worked well. Then I read the message on the matrix board over the interstate that read "wreck 3 miles ahead, 2 right lanes blocked". Considering there are only 3 lanes going south, that has to be a bad omen. 2 miles later, I shut off the bike and put down the kickstand. After 10-15 minutes, I see cars starting, and we crawl past the wreck cleanup and resume speed. A fuel-up near Macon makes for a good excuse for coffee and a bit of breakfast thanks to the folks at the golden arches. Back in the saddle and resume my journey south. As I approach Cordele, things all to familiar. I pass the Farmers Market Road exit where the race track is located that I spent 12 years competing. Just below Cordele I exit the interstate and the old familiar scenery comes into view. As much as this area may change, it will always look the same to me. 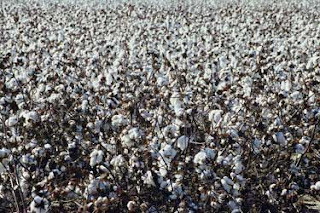 As the road ends and I make my turn and continue south, I can see the cotton fields that symbolize home to me. Another hour of riding and I cross the county line and see the country road where I lived for over a decade. It was dirt when we lived there, the county saw fit to pave it after we left. I pay a quick visit to an old neighbor and friend, but can't stay long. I've made this trip back to rural south Georgia where I grew up to attend the funeral of a close friend's mother. The 4+ hours of riding have given me plenty of time to think about what I have known of her life and what an example she has been to me and all those who have known her. Unfortunately she developed cancer and spent the last few years fighting a courageous battle. Until her last breath, she told anyone that would listen that God is still God and God is good. On the ride back I marveled at how everytime I return to south Georgia it always seems like I've stepped back in time. Things operate at a slower pace and 30 years of memories play back thru my mind as if they were yesterday. As I enter the interstate and head north, I begin wrestling with a brutal headwind. The wind is strong enough that the little 883cc engine loses 10 mph ascending the hills on the interstate, and I have to pay close attention to maintain by lane and heading. Riding a bike without a fuel gauge, one learns to use the trip odometer knowing the approximate range for a tank of fuel. The trip down confirmed my range and I had planned my fuel stop in my head for the return trip. It would be 15-20 miles less than the range of a tank of fuel normally. But, the headwind has severely compromised my fuel mileage and a couple of miles short of the planned fuel stop, I feel the bike surge. I deduct it is running out of fuel. I allow it to surge two more times to get all the goody out of the main tank and flip to reserve. The engine smooths out, and I navigate safely to the fuel stop. After refueling, and resuming my northbound travel, I can see the commuters leaving the metro headed south have gotten down to a crawl. The closer I reach the lower side of the perimeter, the slower the southbound travelers seem to be going. Fortunately for me, northbound seems to be moving well. Soon the familiar sites of Braves stadium, then the Varsity, and all that is downtown Atlanta come into view. After a few brief pauses in traffic, the upper perimeter comes to view. The sun is setting and the temperature is dropping. I certainly would have to stop and add another layer if I was going to be riding much later, but thankfully I am nearing my day's journey's end. When I arrive in our neighborhood and round the corner, I see our garage door open and the light in the garage is on - silently welcoming me back home. I'm tired, a bit chilled, and glad to be home. Trips like this are bitter sweet. I'm saddened for the loss my friend and his family feel. At the same time, I rejoice with them that their family member is no longer suffering through the agonizing pain of cancer. The trip also stirs a lot of memories for me, good times, sad times, dreams, hopes, dreams dashed, but all told the events that have formed who I am - my life story of the last 44 years. After riding to work this morning in 35degs, it's time to upgrade to some electric gear. Some permanent hand warmers are in my very near future!